Uglyworld #254 - Babo Meets The Stig, originally uploaded by www.bazpics.com. Babo called our local supercar dealership today to try and arrange a test drive of a car (she wouldn't listen that it was christmas day and that the people who work there would all be off on their xmas holidays). Babo was adamant that she could acquire the keys of a sports car for a day or two and marched round to their door to sort this out! She knocked on the door several times to no answer and then started shouting "cooo-eeeee" through the letterbox until a figure moved in the back room. 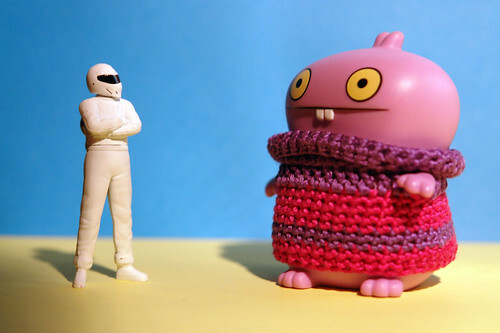 Unknown to Babo The Stig from Top Gear had been drafted into the dealership as a security guard over the festive period. Babo tried to ask Stig for the keys to a 911 Turbo, no response from the Stig so Babo moved down to a 911 Carerra, still no response. Babo was beginning to get a little annoyed and decided to try and stare Stig out - unfortunately she's not watched Stig on TV before so he's still standing there now!! !